NASA's Jet Propulsion Laboratory is an unconventional place with some equally unconventional signs and warning labels. 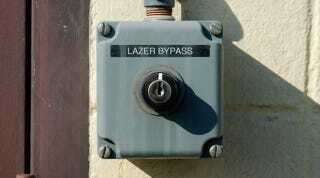 Artist, designer, and educator David Delgado has documented several of them – including the intriguingly labeled, but otherwise mundane looking, "lazer bypass" keyhole (above), and seemingly paradoxical notices like the one below – when he first came to work at JPL. His photos inspired friend and coworker Lee Overtree (founder of arts and education nonprofit Story Pirates) to autotune reading of the signs and turn them into a song (as you do). The result, which you can listen to over at Brain Pickings, is... well... it's something.